Your co-worker is not doing her fair share on the team project. Your employee is chronically late. Your boss yells at you in front of your co-workers. What can you do about these and countless other annoying, frustrating, or troublesome situations? Many people respond by avoiding their bosses, ignoring co-workers, complaining to others, pounding their fists, or ranting on social media. They often miss the most effective alternative: confronting positively. 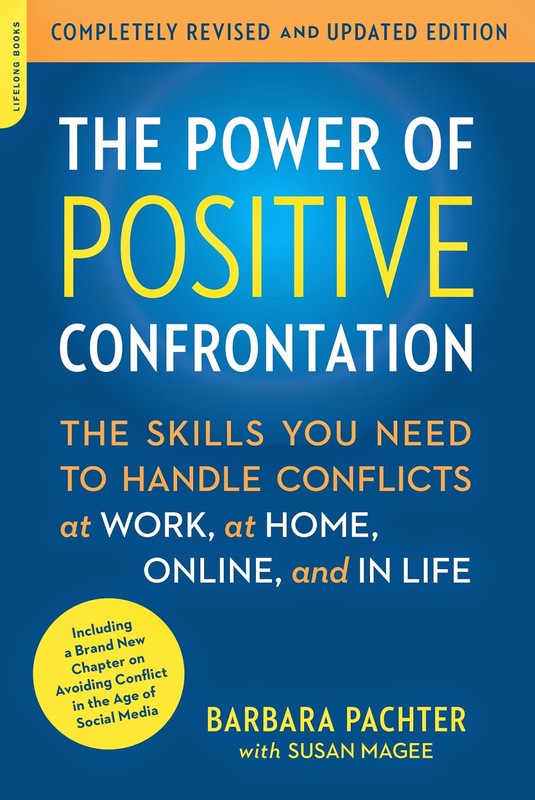 Positive confrontation allows you to confront someone in what I call a “polite and powerful” manner. You are choosing to speak up in a clear, direct, specific, but non-accusatory manner. 1. Pick your conflict. You can’t fight them all. You can’t win them all. Pick the ones that matter to you or have an effect on your work. If they don’t, why not let them go? You’ll be less stressed. 2. Give the person The Jerk Test. We are very quick to make negative assumptions about others. Yet often we have no idea what is driving the other person’s behavior. If you approach someone convinced that the person is a jerk, it is very easy to explode because “the jerk had it coming!” If you consider instead that “maybe the person is a jerk, or maybe not – I will find out,” you are less likely to explode. 3. Pick the right time and place. Confront others in private, and when you are calm. Pick a time that’s good for the other person to talk. If the person is walking out the door for a meeting, it’s not the time to confront him or her. 4. One issue at a time. You don’t want to confuse the situation. Keep the discussion to one topic. You are less likely to get side-tracked if you stick to just one issue. 5. Prepare and practice. You should prepare and practice what you want to say. You are less likely to explode or wimp out if you do. Remember, your wording should be specific, direct, polite, and non-accusatory. My Don’t Attack’em, WAC’em™ model can guide you. WAC stands for: What’s really bothering you? ; What do you want to Ask the other person to do or change? ; and Check-in for the person’s reaction. W = I know you may not see this as a big deal, but I am not comfortable with pictures of me being posted on Facebook without my permission. A = Please take them down by the end of the day. 6. Pay attention to your nonverbal body signals. Have you ever heard yourself saying, “But I didn’t mean it that way!” Chances are your words said one thing, but your body language or tone of voice sent a different message. Make sure your words, tone, and body language are on the same page. Learning new skills takes time. Start slowly. Pick simple situations to address, and build your confidence. Over time, you can master positive confrontation. Pachter & Associates provides training and coaching on assertiveness, positive confrontation and business etiquette. For additional information, please contact Joyce Hoff at jhoff@pachter.com or 856.751.6141 . The Power of Positive Confrontation is for everybody who was never trained, or never understood, that between bully and wimp is a range of behaviour that is positive, distinguished, and real for dealing with life's inconvenient circumstances. Since I am college assignment help service provider at secure assignment help in Australia. The skills it teaches will not only improve your aptitude to confront others, but will also help you to live a more conflict-free life. Your attitude is just as important as your skills and abilities. From high-stress office places to quick stepped restaurants, learning to negotiate a new job needs a unique mixture of people skills and dedication. You can learn to make a good impression on your first day, and turn that good impression into a good reputation into the future. It is also necessary to learn how to behave or act with co-workers for students who are taking dissertation writing help service from me at Quality Dissertation where we are providing academic writing help as well as education or career related consultation. And your blog will sure help them to learn positive confrontation. Thanks for sharing this powerful steps of Positive Confrontation. We find it hard to controlling our emotions effectively when we are talking about something challenging or panic-inducing. Our CV writers team at CV Folks Discuss the positive and negative possibilities of each suggestion before reject any suggested solutions, and decide on follow-up plan that meets the needs of all employee. Engaging in productive confrontation covers the way for diversity of thought, developing healthy boundaries, innovative approaches and better decision-making all of which are essential if we want to thrive in our lives and work. Many thanks for sharing Steps to Positive Confrontation. Regardless of our averseness to confront tough challenging people, we need to. We can’t advance, succeed, or grow without confrontation. I am always told my students that learn new skill and Pick simple situations to speech, and build your confidence who are come to seek dissertation help from me. Engaging in productive opposition covers the way for range of assumed, increasing healthy boundaries, arriving at new, innovative approaches and better decision-making all of which are essential if we want to thrive in our lives and work. Effective step of Positive Confrontation you shared here. When someone you love is engaging in self-negative, hurtful or undesirable behavior, a conflict may be necessary to communicate your feelings about the behavior and resolve it before it becomes worse. I am work with personal statement writers UK and sometimes this type of situation occur at our institute. But I believe that an effective technique for peaceful opposition is using "I" phrases to talk about the situation. This helps you avoid placing blame on the wrong person and making them go immediately on the defensive.